The mRNA-templated synthesis of peptides by the ribosome, can be manipulated to incorporate variants of the 20 cognate amino acids. Such approaches for expanding the range of chemical entities that can be produced by the ribosome may accelerate the discovery of molecules that can perform functions for which poorly folded, short peptidic sequences are ill suited. Here, we show that the ribosome tolerates some artificial helical aromatic oligomers, so-called foldamers. Using a flexible tRNA-acylation ribozyme—flexizyme—foldamers were attached to tRNA, and the resulting acylated tRNAs were delivered to the ribosome to initiate the synthesis of non-cyclic and cyclic foldamer–peptide hybrid molecules. Passing through the ribosome exit tunnel requires the foldamers to unfold. 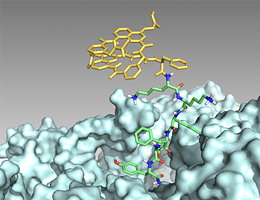 Yet foldamers encode sufficient folding information to influence the peptide structure once translation is completed. We also show that in cyclic hybrids, the foldamer portion can fold into a helix and force the peptide segment to adopt a constrained and stretched conformation.